I was getting a little tired of my maternity clothes this weekend, so I wore some of my non-maternity clothes that still work this far in my pregnancy. The last time I wore this easy cotton striped dress was back in August when I was around 2 months pregnant and not showing yet. I was happy to see it still worked now that I'm 7 months pregnant. The waistline did cut across my stomach a little bit, but I planned to layer a scarf on top anyway. My sister Mary Beth gave me this beautiful scarf last year for my birthday. The colors in it worked well with the stripes in the dress and the oatmeal color of the cashmere cardigan. Comfortable layered look! That's nice you're still able to fit into non-maternity clothes! This is a very cute look and I love the beautiful colors of the scarf! You are looking great! I love the dress. You look adorable! 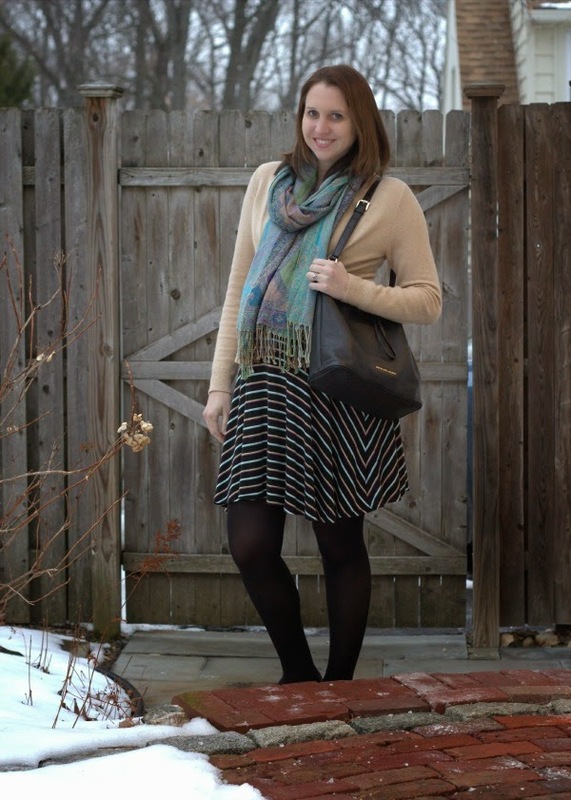 The dress is super cute and I love the layers with the scarf and sweater! Thanks for joining the Celebrate Southern Linkup with J and me! Cheers!